First and foremost it is important to recognize that supplements are not a substitute for a poor diet! Make those changes in your nutrition that will start the process of helping your body to help itself (see " pH balance " and " Natural remedies ") Having said that, the evidence is growing that in the Western world the concept that a normal, healthy diet is all you need for optimum health is becoming more and more questionable. Each person is a unique individual. Our health will be affected by many factors, viz diet, age, genetics, stresses, activity levels, environmental factors and more. Therefore, it makes sense to make choices based upon your individuality and not to just take "the latest wonder vitamin/mineral" or "the same as my friend takes" because it works for them! The following should help you make appropriate choices for yourself . Although needed in smaller amounts than fats, proteins or carbohydrates, vitamins are no less important. they release enzymes, which in turn make all bodily processes happen. Vitamins are needed to balance hormones, produce energy, boost the immune system, make healthy skin and protect the arteries. Vitamins A,C and E are antioxidants; they slow down the ageing process and protect the body from cancers, heart disease and pollutants. B and C vitamins are vital for turning food into mental and physical energy. Vitamin D help control calcium balance. Like vitamins, minerals are essential for just about every body process. Calcium, magnesium and phosphorus help to make healthy bones and teeth. Nerve signals, vital for the brain and muscles, depend upon calcium, magnesium, sodium and potassium. Oxygen is carried in the blood by an iron compound. Chromium helps control blood sugar levels. Zinc is essential for all body repair, renewal and development. Selenium and zinc help boost the immune system . Brain function depends on adequate magnesium, manganese, zinc and other essential minerals. The basis of any supplement programme is a good high strength multivitamin/mineral. A good multi should contain all the vitamins and minerals. Also, there are good multis that are age related. Also, as with most things, you pay appropriately for quality. The cheapest supplements are usually so for a reason - cheaper forms of nutrients, or lower amounts, are used. Always read the small print on the packaging. 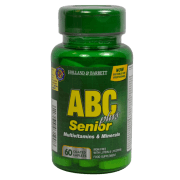 For example the ABC Senior from Holland and Barrett will tell you that if you regularly eat liver or liver products to avoid supplements ​ containing vitamin A. The following diagrams will help you identify how vitamins and minerals affect different parts of your body. In the Natural remedies sections you will find more in-depth information, including any considerations or concerns you would need to take into account, e.g. if you are ​taking medications.